Good evening Blues and welcome to the mid-week transfer news update from CFCnet, where we take a look at all the latest potential arrivals and departures at Stamford Bridge this summer. First of all, many British press outlets are reporting that Jose Mourinho wants to add Charlie Austin to the new look Chelsea attack after already completing the loan of Radamel Falcao. The Standard’s Simon Johnson has confirmed that Chelsea are serious contenders for the QPR striker and could make him one of their front three with Loic Remy expected to leave. Austin will leave his relegated side this summer and only has a year remaining on his contract their, meaning Rangers will need to cash in now if they are to coup any money for the young forward. Whether he’d be prepared to be second or third choice striker or not remains to be seen, but this would be an excellent signing for me. Austin is a battler, a fighter and he hassles defenders and scores vital goals. A perfect extra striker to come in a put in 100% and he’s also home grown. Meanwhile, Chelsea are still weighing up a move for French Under-21 International Samuel Umtiti according to The Telegraph. The Lyon defender is tipped for a big future in his nation along with current Chelsea man Kurt Zouma and many of the big clubs are in for him. Mourinho is thinking long term replacements and cover for John Terry and Gary Cahill and could move in with an offer this summer for the 21-year old. Petr Cech could well be going to Arsenal but the Gunners seem fast to squash any rumours that Alex Oxlade Chamberlain could be moving in the other direction in a swap deal. Mourinho had previously hinted that any deal for Cech might need to involve a player going to Chelsea in return, but it appears that it won’t be any of the favourites Theo Walcott of Chamberlain. Chelsea are still moving on Atletico Madrid defender Miranda. The Brazil international is seen as extra reinforcements to an area that Mourinho feels needs added personnel. Miranda would enjoy a stint in the Premier League and Mourinho is more than confident in his ability. A deal here could certainly happen this summer. 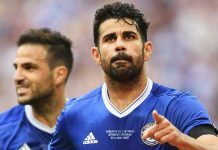 Previous articleCan Chelsea fans and owner really face another potential flop?